My latest pattern... the Voilà Vase! 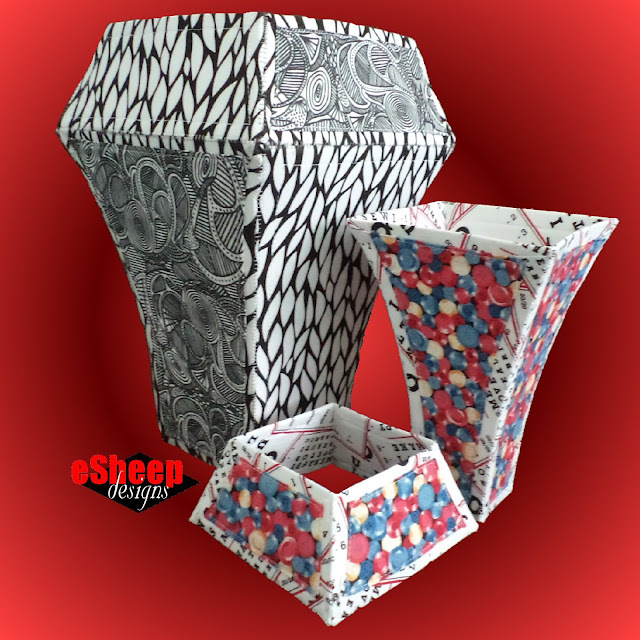 It's been some time since my last pattern release and today I have one for something very different from my past designs: a fabric pieced flared vase with optional permanent or removable topper. Having previously admitted that I'm not a home decor fan, this latest creation is most definitely a home decor item. In any case, when I felt compelled to do more 3D "paper" piecing after making a hanging ornament, the concept of a vase was the first thing that popped into my mind. The subsequent plan to turn it into a pattern was two-fold. First, I hadn't written up a pattern in about a year and needed "the exercise", so to speak. Second, it seemed like a unique item to write up as a pattern, made more appealing by the fact that it's not too difficult to sew up. If you're wondering how big this is, let me say that it was designed to be a statement piece. With the topper, the vase is about 13” (33cm) high by 8" (20cm) wide, with a 4” (10cm) square base. Without the topper, it's 10” high (25.5cm). So it's not small. Choose your fabric wisely and you'll have a one-of-a-kind designer vase to highlight that special spot in your home. While my proof of concept vase ended up featuring the contrast panels on the exterior, with this one, I decided to switch it up and alternate all the panels. It did require me to pay more attention in the final assembly stages (and yes, I had to take out my stitch ripper more than once), but I like the result. I would imagine that using four different contrast fabrics on top of a main fabric would also make a striking vase. After a rough start looking for testers, Sarah at Cozy Nest Design came to my rescue and put me in touch with some talented bodies who were up for the challenge. Here are the the results of their pattern testing, in the order in which I received them. Of the testers that were sent my way, I was already familiar with Marilyn. I've always admired her selection of fabrics along with her meticulously crafted end products. She made her version of the Voilà Vase with a permanent topper. A handy tip from Marilyn: "I used 1/4" washable wonder tape to turn in the sides of the contrast fabric and it worked like a charm. It was an easier way to measure the 1/4" turn under and it stayed in place until I attached it to the main fabric and Peltex." Mary Ann also made her Voilà Vase with a permanent topper. If you're observant, you'll notice that some of her cardinals are not perched upright. ;-) However, if you're even more observant, you'll notice that none of her stitching shows. Mary Ann used invisible thread on her vase. When I asked about how difficult that might be to sew with, she says she's had no issues using the ones from Superior Threads. I definitely learned something new when I heard that Synthia's sewing machine didn't have a zigzag stitch. That possibility never, ever occurred to me, so it was serendipitous to discover it during pattern testing. On the down side, this meant that Synthia had to hand sew all of the panels together. Despite physical challenges, she ended up being proud of her persistence in finishing. By the way, Synthia's Voilà Vase is the basic version without a topper. And given the eclectic fabric and her choice to alternate the panels, I had to share with you this shot of the inside of her vase. The PDF for this pattern is 34 pages long, with full-size templates, detailed instructions and over 60 photos to help you create your own Fabric Pieced Voilà Vase. Measurements are provided in both metric and imperial. As a bonus, I have included instructions on how to create the templates needed to make the smaller proof of concept version. I would say that you'd be perfect for this project if you have some sewing experience, have used fusible interfacing before and are interested in trying out "paper" piecing. Even though you will be producing a three dimensional result, the construction steps are not difficult. 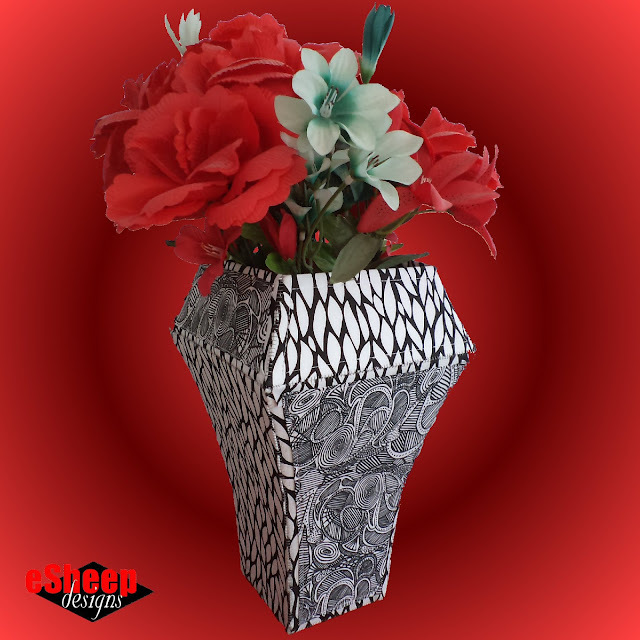 Apart from some areas where you may have to deal with thick layers, the Voilà Vase is pretty "beginner" friendly. The cutting and interfacing will take up most of your time. But since most of this is machine sewn (as long as you have a zigzag stitch), it goes quickly once you get started. It's the sort of project that, if you start in the morning, you'll be done by the end of the day. What do I Need to Make this Project? 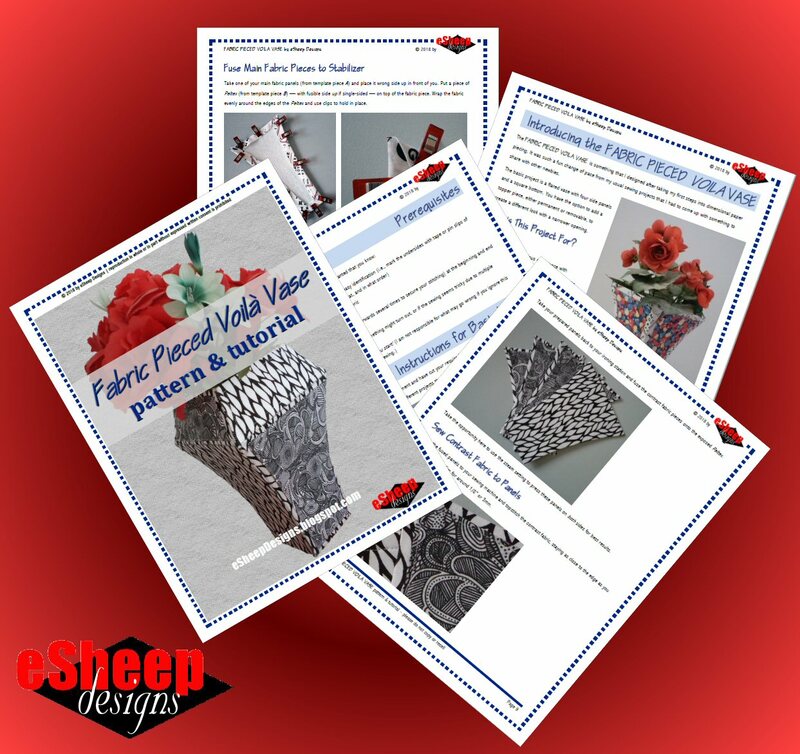 If you are "sew" inclined, feel free to make and sell as many Fabric Pieced Voilà Vases as you care to; I only ask for the small favour of crediting me and this blog by attaching the following card to the item. I like Synthia's vase the best because I love the fabric she chose. The fabric vases I made in the past were all done by hand, which isn't hard to do at all, just a bit more time. Good luck with pattern sales.